Welcome to week 3 in our Summer Savings theme month! 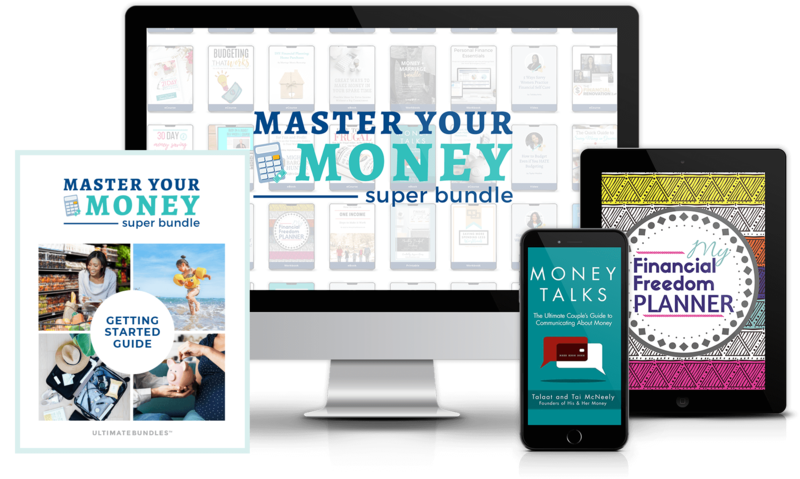 I hope you’ve been enjoying these heat-and-frugality themed topics we’ve been discussing over the last few weeks, and if you have any summer savings topics you’d like covered, just let me know! Week 1 we covered summer skin saving tips, including wearing sunscreen and keeping covered up during the hottest parts of the day. 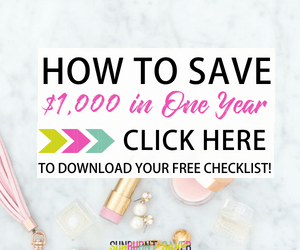 On the theme of sunscreen, I also talked about how to find the best deals on sunscreen and save money when buying sunscreen. Week 2 we discussed 10 different frugal ways to beat the heat, including going to the mall or visiting cat cafes! We also talked about how to celebrate Father’s Day while keeping cool and saving money. I hope you all had a great weekend, and best of all – stayed cool! And now on to Week 3! As you all know, I complain about the heat a lot, and I have it good compared to others. After all, I work in an air conditioned office, go home in an air conditioned car to an air conditioned home, and we have ceiling fans to constantly keep cool air circulating. I also have access to cold water and shade throughout the day. Unfortunately, not as many people are as lucky as I am. Heat-related deaths aren’t just the leading weather-related cause of death in Arizona, but nationally. We often hear about catastrophic events, like tornados, floods and earthquakes that kill people in the US, but heat-related deaths kill more people than those disasters combined. In 2013, it was estimated that extreme heat causes an average of 658 deaths in the United States. Heat-related deaths are a silent killer. Heat exhaustion and heat stroke are typically not immediate killers – you don’t go outside, become exhausted in 10 minutes, and die. That’s what makes identifying someone suffering from heat-related illnesses difficult. However, there are ways you can help others, yourself, and your family stay safe this summer. You can help others in your community immediately with a few affordable items. The best thing about these items is they frequently go on sale, can be bought in bulk, and are durable. While some of these items must be donated unopened, and can’t be donations from your house, they’re typically things you can pick up extras of when they go on sale. Hot weather and dogs aren’t a good combination. In their natural exuberance, children (and some pets) will just run and run and run until they collapse. While this is fun to watch (knowing someone is going to actually sleep tonight! ), it’s not so great when it’s really hot outside. If you’re out with children or pets, encourage them to drink water. Kids may complain they’re “not thirsty”, but ask them to drink a little water anyway. Your dog will typically drink when s/he is thirsty, but it’s not a bad idea to have a hose and spray them with some water too. Note: check your water temperature before spraying your pet with an outdoor hose. Extreme cold can shock your dog, but extreme heat (much more likely for water from a hose left out in the sun) can scald your dog. Always check water temperature before spraying it on anyone, including you, your pets, children, etc. For a variety of reasons, the elderly are among the most likely to die from heat-related illnesses. 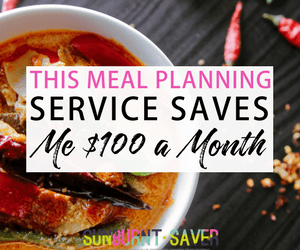 Whether they’re trying to save money by turning off the air conditioning, or simply can’t feel how warm they are getting, there are still ways you can help. If you have elderly neighbors, check in on them once a week and ask how they’re doing. It helps if you already have an established relationship, but even if you don’t, you can always make up an excuse to stop by. If they need help pulling weeds and don’t have the stamina to stay outside long, offer to help. If you can’t offer your time, you can always contact your city’s neighborhood or human services programs to see if they offer elderly assistance for lawn maintenance – yes, some cities do offer this service! Call and check in on elderly family members as well. If you’re able to stop by, great! You (probably) don’t need an excuse to stop by and visit family. With family members, you can be more upfront if you suspect something is wrong. 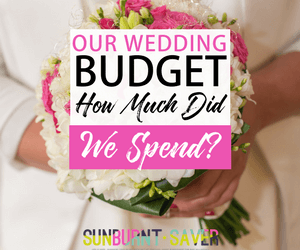 If their house is too warm, ask if they’re trying to save on the A/C bill, if they need some portable fans, or if the A/C is just broken and they haven’t realized it. Depending on how independent your neighbors and family are, they may not want you to interfere too much. However, by checking on them and letting them know you’re around to help, they’re more likely to think of you when a true emergency arises. When in Doubt, Call 9-1-1! If you see someone in a park or on the street who appears to be suffering from heat distress, try to approach them and ask how they’re feeling. If you can, offer them a water bottle and try to get them in shade. If they’re unresponsive and appear flush or dizzy, call 9-1-1 to report heat distress. If you see an infant or pet left in a car on a hot summer day, immediately call 9-1-1. Some may say you’re being overly dramatic by calling 9-1-1 for a child or pet that is waiting in the car, “only for a couple of minutes.” However, according to the Humane Society, on an 85 degree day, the temperature inside a car with the windows opened slightly can reach 102 degrees in ten minutes, and 120 in 30 minutes. And that’s an 85 degree day – not 115 degrees! Would you want to be trapped in an 102 or 120 degree car? I don’t necessarily advocate breaking car windows unless an infant or animal is clearly in heat distress (not responding to taps on the window, looking listless, lethargic, eyes rolling back). Unfortunately, in our litigious society, you could be sued (or assaulted) by the owner of the vehicle. Of course, if you see an infant or pet in distress, have called the police, and are genuinely concerned, you have to make that call yourself. Note: When I say “child” or “infant” I generally mean a young person who can’t open a car door by his/herself. I realize this may be a judgment call, but if you see an 8 year old who’s sitting in the car, reading a book or playing on an iPad, with the window cracked, you might not need to call 9-1-1. An 8 year old should have the capacity to feel him/herself getting hotter, open the car door, or call Dad/Mom. Summertime doesn’t have to be a scary time that you have to avoid. By practicing some commonsense measures, like staying hydrated and covered up, you and your family should have a great time this summer. 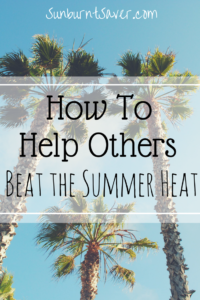 You can help others in your community that don’t have access to shade or a cool place to stay by donating necessary items and keeping your eyes open. A little commonsense goes a long way to making sure everyone has a safe summer! 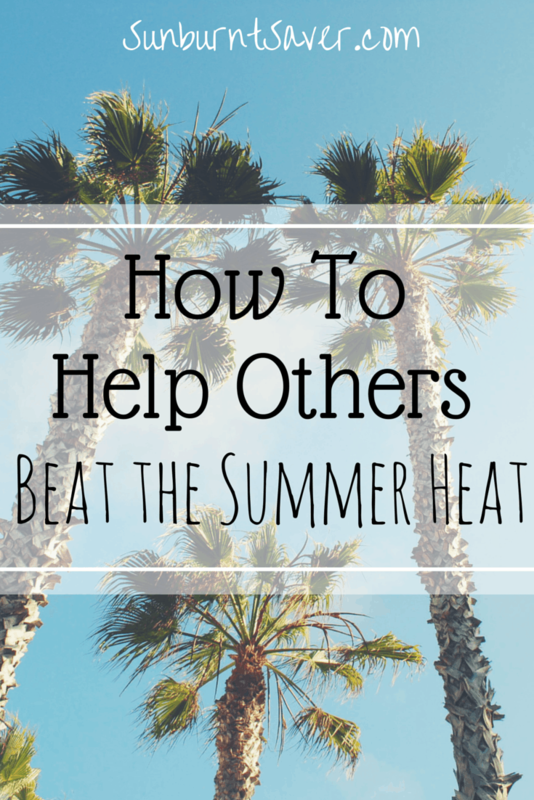 How do you help others or have helped others beat the summer heat? What are you tricks for staying cool during the hot days? This is really great advice and something that is often overlooked until there is a tragedy we hear about. I was in Utah a couple weeks ago and it was “only” 103 but good lord I can’t imagine what 110 or 115 feels like. I melt when it’s 85 here. I know! I joke all the time about melting (although sometimes it’s not a joke…) but I know I have reliable access to A/C (or at least fans). Unfortunately, like you said, a lot of people don’t have access to A/C or fans, and we don’t realize it until we hear about someone dying on the news. The heat really is a silent killer, but if we try to be aware of signs of distress from people in our community (and/or donate to heat relief organizations), it can go a long way to prevent needless suffering. Anum, I saw that too, and that plus a few deaths that have occurred (so far) in Phoenix pushed me to write this post. It’s hard to fathom when I’m sitting here, in my air conditioned house, that some people don’t have access to or money for air conditioning. Some people might say “just sit in front of a fan” but, as we saw in Pakistan and see here, it’s not that simple. It’s not just a matter of “being hot.” It’s not as simple as “sitting in front of a fan” – you also have to have electricity for a fan, and not everyone has access to or can afford consistent electricity. Thank you so much for sharing that news with us, Anum! Heat related deaths and illnesses isn’t just a local issue – it really is global. This was such a thoughtful post!! You’re right – most people are very lucky to have AC in their offices, cars and homes, but unfortunately not everyone has the luxury. Thank you Sarah! It’s sad how easy it is to forget about others who don’t have reliable (or affordable) access to A/C. In the summer, A/C is required almost everywhere (except beach towns, I guess! :)), and it’s so expensive. It’s hard to imagine someone who can barely pay the bills also struggle with paying an inflated A/C bill. Not everyone is lucky enough to have extra money to pay higher utility bills! I’ve called 911 on someone who left a dog in their car while at the bank. Sure enough, the owner lady came out before the police arrived. I told her I called the police on her, gave them her license plate number, etc. and that she’s lucky I didn’t break her windows. Normally I’m not a confrontational person AT ALL but when she started to give me attitude for caring about her pet more than she did, I didn’t hold back. Bringing a bottled water with you is really helpful if you want to beat the heat especially when you are outside. Our summer just ended and it’s now rainy season in here, glad to know that this year was the lowest record for fatality because of heat stroke. Oh yes, definitely bringing bottled water (and maybe a couple bottles) is helpful to have, even if you’re just running a few quick errands. You never know if you’ll get stuck behind an accident and really need water. Or run into someone who needs it more than you! I’m glad to hear this year was a record low of heat-related fatalities. Hopefully more people are helping each other out and paying attention to signs of heat illness! These are some excellent tips. Over the summer, Utah was having a bunch of days in a row over 100 degrees, and I felt so bad for all of the people who would walk to work or work outside. Some poor guy working at a restaurant was standing in a big heavy costume waving a sign, and it must have been 104 degrees outside. We pulled over and gave him a granola bar and some water, and he looked like he was about to faint! That experience has now made me keep a 20-pack of water bottles in my trunk at all times. Thanks for your tips about what you can donate to your community. You make a great point that shelters and emergency relief providers would need unopened water bottles. Should a natural disaster hit and the water service infrastructure be compromised, a lot of people are going to need a lot of safe drinking water. I’ll keep these tips in mind the next time I make a donation. Thanks. I’m glad you found these tips helpful, Aaron! Many people forget about water bottles when they donate, but everyone needs water, so it’s something shelters won’t turn away.